Trainee PE teachers experienced an alternative version of invasion games now gaining increasing popularity in UK secondary schools. The game is a non-contact version of lacrosse which uses inexpensive plastic-headed sticks and oversized lacrosse balls. It is particularly suitable for delivering invasion games skills within the PE Curriculum. Whilst the principles of the game are essentially the same as any other goal-throwing game, the skills and techniques are different as players have to attempt to master the skill of cradling a ball with their stick as well as sending and receiving. 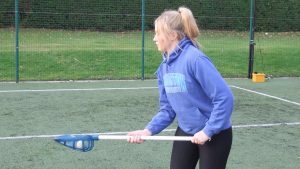 PGCE and School Direct PE course leader Dr Gary Stidder said:”Lacrosse is growing in popularity in schools across the country. This entry was posted in PGCE & QTS, Physical Education by Kerry Burnett. Bookmark the permalink.